It is no news that the Super Bowl is a big deal in America. No, not like that, Super Bowl is a BIG DEAL in America, and even non-fans can enjoy watching The Super Bowl Halftime Show. By the way, this year you will be able to see Maroon 5 as a headliner. So Super Bowl LIII is coming to town on February 3, if you live in Atlanta that is. All the others will have to watch the game of the year that will take place at the brand-new (opened in 2017) Mercedes-Benz Stadium online. Because who watches TV in 2019, right? And what is better than the live stream of the Super Bowl? Only free live stream of the Super Bowl! Football lovers outside of the US that don’t have the access to the online streaming can try to bypass the content restrictions by installing the VPN service. So if you can’t watch the Super Bowl live in your country, the best way might be to just download and install a VPN. It will allow you to choose the IP address that is acceptable to live stream the game. After that, you are all set to watch Super Bowl 2019 from anywhere. This VPN supports most streaming services and is as fast as it gets. All you need is to download a VPN app. This tool can help you mask your current geographical location and make it appear as if you are in the United States. This way you will get to watch the Super Bowl just as everybody else in the United States. You only need to change the server location to “United States”. Seats inside a Super Bowl stadium are notoriously expensive. For now, the cheapest ticket costs $3,430 per person far back from the field, and there is only one ticket left. The closer to the action you want to be, the more screwed are the prices, ending halfway through the stratosphere around $15k. So unless you are very well off, you would be better thinking about the alternatives. Luckily for you, this year Super Bowl watching options are better than ever before. And we are giving away all the information you need to choose the best one for you, no matter where you live. If you are living in the US or UK, everything is fairly easy. For the United States the best option, naturally, to watch it on CBS. Of course, in addition to broadcasting, the game will be available through the network’s Sports website and mobile app. 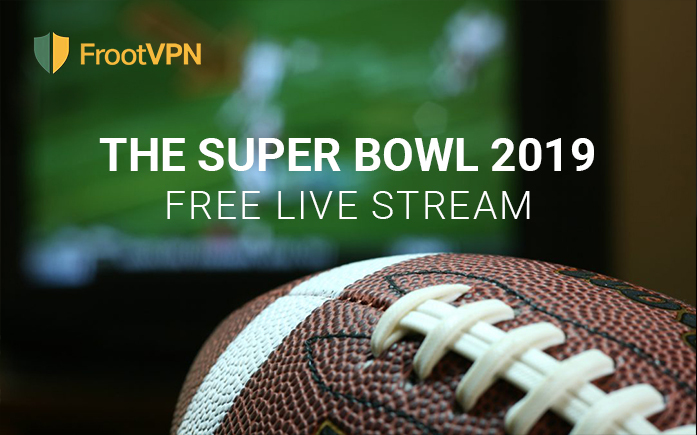 The big plus is – you don’t even have to sign in to stream the Super Bowl. If you are from the UK and not looking for pubs that show Super Bowl 2019, you might be not from the UK after all. So for those of you who are looking, you can check this site out – matchpint.co.uk. Just enter your address and select which pub you like best. And yes, BBC will also have coverage of the Super Bowl on TV and online. It is not surprising that Super Bowl is broadcasted in countries like Canada (TSN 1, CTV 2, RDS) or Australia (ESPN, 7 Network), and even France (W9, BeIN Sport) is not out of the question. But others, like India (Sony Ten, Sony Six), Africa (Super Sports, Zuku) or China ( Fox Sports, BesTV ), may be a surprise. Also, you can just go straight to the NFL’s website for the Super Bowl in seven languages that is available in 170 countries. But it is not for free. If you prefer a streaming platform, you can do it too. Super Bowl will be available on Samsung Smart TV, DirectTV, Xbox One, Hulu with Live TV, PlayStation Vue, Chromecast, Fire TV, Android TV, Roku, FuboTV, Apple TV, YouTube TV and more. Most of those services will cost you around $40 a month though. We are not about to give you a history lesson, but in case you want us to refresh your memory, here it goes: this will be the third Super Bowl played in Atlanta; Super Bowl XXVIII was held in 1994 (Cowboys won); Super Bowl XXXIV happened back in 2000 (Rams celebrated the victory). Be ready to become a part of the NFL history on Sunday, February 3, 2019. Kickoff time is 6:30 p.m. ET.